The progressive and innovative Member of the National Assembly for D’Arcy McGee, David Birnbaum, has launched an impressive short video destined specifically for the residents of the riding encompassing Cote Saint-Luc, Hampstead and the western section of Snowdon. These are all very welcome words for D’Arcy McGee residents and indeed all Quebecers. I look forward to the premier putting these brave and inspiring words into action. The closing remarks pay tribute to former D’Arcy McGee MNA, Dr. Victor Goldbloom, who passed away two weeks ago. The premier’s comments are touching. Congratulations, once again, to our energetic MNA for this excellent communication effort with his constituents. Don Macpherson’s column in today’s Gazette strikes a chord with many English-speaking Quebecers. It is infuriating that any decision within Quebec politics invariably comes down to a question of language. Your mother tongue is not the single most important criteria in characterizing an individual. What about skill, competency, honesty, integrity, loyalty, good judgement and a friendly smile? Macpherson gives the example of our MNA, David Birnbaum, being passed over for a cabinet appointment by Premier Philippe Couillard, presumably because of his linguistic heritage. When will Quebecers finally say enough is enough? Must language be our primordial defining quality? Shouldn’t it suffice that one can communicate effectively with one’s fellow citizens? Anyone who has heard him speak would agree that David Birnbaum is indeed such a communicator. Eloquent, effective and persuasive. I hope that my premier will judge his team members, and all Quebecers, by the content of their character as well. Read more: Don Macpherson: The invisible barriers facing non-francophones in Quebec politics | Montreal Gazette. The need for an Office of Anglophone Affairs to represent the interests of 800,000 English-speaking Quebecers is reasonable and quite evident. First, having three cabinet members of the Quebec Liberal Party who come from the English-speaking community does not absolve the government from its ongoing obligation to its English-speaking population. Cabinet members come and go, so do governments, and cabinet members have many more responsibilities than uniquely watching out for linguistic issues of their constituents. The last four decades have shown us that English-speakers promoted to cabinet are no guarantee that the rights afforded to the English-speaking community will be respected in each ministry and throughout the government. No disrespect or lack of appreciation to our Anglo MNAs, past or present. Their competencies are far from limited to their mother tongue. In D’Arcy McGee riding, for example, David Birnbaum is off to a great start, is very interested in his constituency and his assistance is quite sincere, I have no doubt. Lawrence Bergman was a model MNA, of the highest calibre. Robert Libman (Equality Party) was elected specifically because of his position on language and Bill 101 and had wide community support because he was a thorn in the side of the government – a voice specifically for the English-speaking community. An Office of Anglophone Affairs would be such a representative body that is sorely lacking in Quebec City. Editorial: An Office of Anglophone Affairs is needed now more than ever | Montreal Gazette. Second, in an era when a judge of the Quebec Court rules that it is legitimate for the government to deny the rights and freedoms guaranteed to all Canadians and Quebecers, such as this week’s ruling to uphold Bill 101 with respect to marked predominance of French on signs, it is clear that the Quebec English-speaking community needs greater presence within government. An office, as suggested by Commissioner of Official Languages, Graham Fraser, would be a good start. Smaller English wording on signs will convince more people to speak French? Nonsense. This is nothing more than the government, through its OQLF, bullying small business owners, who have enough trouble making a living in this province without being restricted from communicating with their non French-speaking customers. It is harassment of Anglo seniors who have difficulty reading much too small English wording in the few cases where English is even provided. 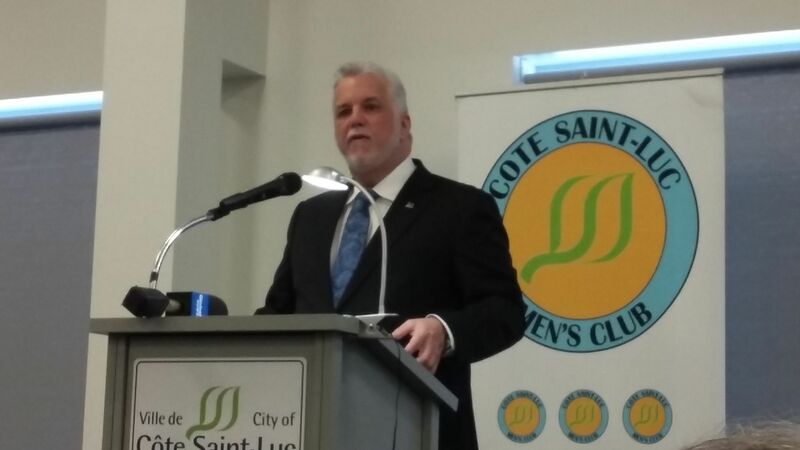 It is pure politic and it is contrary to what Philippe Couillard told us in last year’s election campaign (‘English is not the enemy’). Finally, Quebecers were screaming their support for freedom of expression, alongside people of good will all across the planet just two weeks ago. Where are they today? Where are our business leaders demanding their freedom of expression to run their businesses as they see fit in order to create wealth in our province? Where are those politicians who waved their signs upholding freedom of expression? Where are all those marchers? We’re quick to cry for freedom for everyone all over the world. I fully support that. But what about right here in Quebec, in Canada, where we have something called a ‘Notwithstanding Clause’ that allows our own government to deny our rights? What about our own freedom of expression? All other provinces have an office for their French-speaking communities. Anglo Quebecers need a voice too. The Sûreté du Québec’s policy of issuing messages on Twitter to the general public in French only is “ludicrous,” says Côte St. Luc Councillor Glenn Nashen. Nashen, who has also complained about the lack of English on the Montreal fire department’s website, displayed a Twitter conversation he had with the SQ on his blog. In response to a French SQ general Twitter message about safety during the vacation period, Nashen asked if the SQ shouldn’t also be wishing English-speaking Quebecers a safe vacation as well. The SQ responded, in English, that it wishes everyone a safe vacation. “The account is in French only, but we respond in English to English tweets,” the SQ message adds, in English. Nashen then asked if the SQ has an English-language Twitter account. “How ludicrous it is that the provincial police will not communicate with hundreds of thousands of English-speaking Quebecers plus hundreds of thousands more tourists and visitors unless they are asked a question in English?” the councillor wrote on his blog. “This nonsense has gone unchecked for far too long and it’s high time that the Liberal government correct the overzealous policies of its departments that are nothing short of mean-spirited, disrespectful and counter-productive in the dispensing of public safety and public service messages. The official added that English will be tweeted in case of emergencies, in case of a life in danger and if an anglophone is involved. “We will then do it in English, exceptionally,” the official said.